Three people were taken to the hospital Thursday evening after their small private plane crashed into a playground in Enumclaw and burst into flames. According to the Enumclaw Fire Department, the pilot and one passenger were airlifted to Harborview Medical Center in downtown Seattle; a third was taken to Harborview by ambulance. As of Friday morning, the pilot remains in critical condition and the other passenger in serious condition. The third person has been upgraded to satisfactory condition. The Federal Aviation Administration said the plane was a single-engine Cessna 172. The cause of the crash is still unknown, but the incident did occur near Enumclaw Airport, just off 244th Avenue Southeast. It’s unclear whether the plane in question was taking off or landing. One witness, who took a picture of the crash, told King 5 that the plane went down at Rainier Trails near Enumclaw High School. Since the 1970s, there has been a 75 percent drop in total deaths from general aviation accidents in the United States, according to the National Transportation Safety Board and the FAA. However, accident rates in general aviation, defined as all domestic civilian air travel except scheduled commercial trips, has largely stayed the same over the past decade. There’s just over one death for every 100,000 hours, and while the accident rate and fatalities in corporate and business jets are down, the same numbers are up in personal flights. 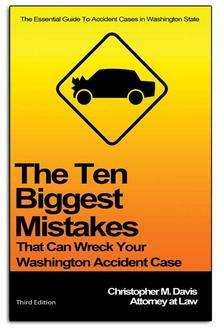 Accidents are up 20 percent; the fatality rate is up 25 percent. When comparing private air travel to car crashes, statistics suggest that stepping into a private plan is about 19 times more dangerous. The Cessna 172 has long been the most popular private plane in the United States, and though many are quite old, the plane has a strong safety record. A majority of accidents in general aviation come down to pilot error, according to the NTSB. What's Next For Victims Of A Plane Crash? In many cases, a pilot unfortunately carries more liability insurance on his or her car than on the airplane involved in the accident. Some might have none at all. Small plane crashes can be complex, and federal legislation protects aircraft manufacturers from liability claims on planes older than 18 years, and a majority of active aircraft are older than that. To protect yourself in case of a plane accident, always carry sufficient insurance. To pursue claim for damages in the event of a plane accident, go to an experienced attorney.